An ECS in cloud environment gets its networking ability provided by VPC which is a private network, means you can’t talk to other world except your own private network nodes. To access the outer world that is the internet you should apply and bind an EIP(Elastic IP) to your ECS. Login to the user pane and select the ECS. When loaded go to the EIP tab. Select the View EIP to see the available EIP for your VDC. If you applied for EIP before than you will get a list of EIP otherwise you will get the list empty. For this instance as we didn’t applied for the EIP so the list is empty. If you already applied for EIP and you have list of EIPs then skip to the step 10. Apply for EIP to reserve a pool of Public IP address depending on your applications need. You can not apply for more than five EIPs for your VDC. Choose External Network from the list available. Choose Subnet from the list available. Choose Assignment Mode, default is Automatic. Choose Quantity in this case to reserve the all five provide 5. Choose Validity Period, generally Permanently Effective. Provide the Bandwidth Settings, take a look at Current Configuration and select Apply Now. And here the list of five EIPs that reserved from the cloud service provider. Now go to Hmepage from Menu then Select ECS that you want to bind an EIP. Later go to the EIP tab. Now select the Bind EIP. 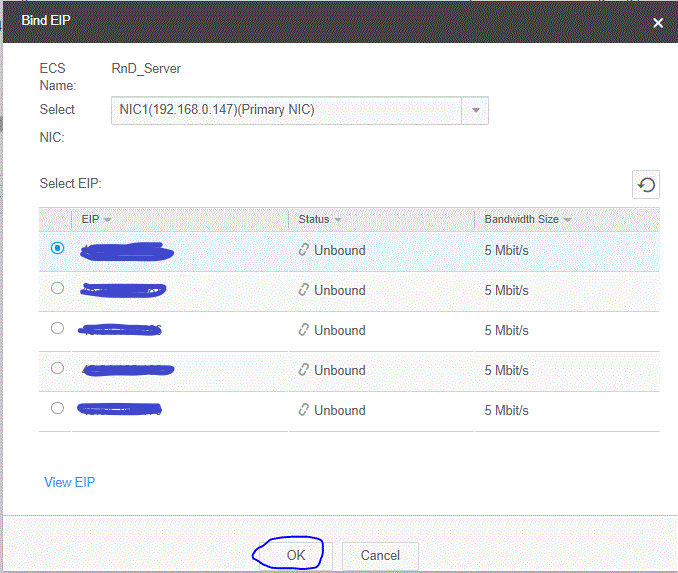 Select the NIC and the EIP from the list and Select Ok. Wait for seconds and you will see the bound EIP under the EIP tab. Also it will be showed under the Elastic Cloud Server page in the row of the ECS information. Do not reserve more EIP than you need, generally providers charge for inactive EIPs. In an ideal architecture your application or servers should communicate each other through private network, only servers or applications accessing by End Users needs to be publicly advertised hence the need for EIP. Before you could login to the ECS you should allow SSH port 22 in your ECS Security Group for Inbound Rule.